The text processor is also suitable for creating simple pamphlets and flyers with graphics. However, when creating the page layout, it is quite diffi cult to say in advance whether the text to be inserted will later run without large gaps. Fill up the layout with dummy text at the beginning itself. Important: This should comprise words of diff erent lengths, otherwise the layout can’t be effectively evaluated. 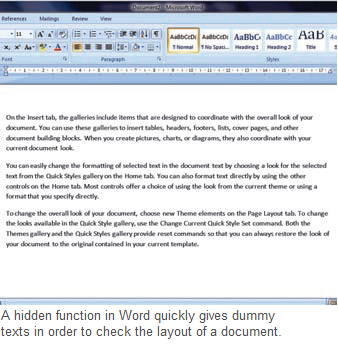 In principle, you can simply copy any text from another document, but just be sure to remove the formatting fi rst. This goes faster with a Word function that is not commonly used. Type in ‘=rand()’ at the desired point of your document and press enter. 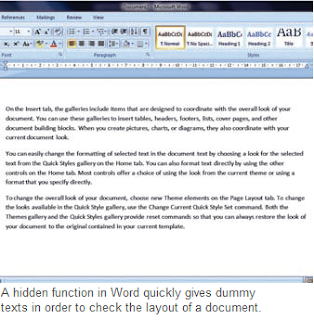 Word now automatically inserts three paragraphs with fi ve pre-defined sample sentences each. This function can be controlled with two parameters. For instance, you can use ‘=rand(4,7)’ to insert total four paragraphs with seven sample sentences each.